The bike lanes planned by the San Francisco Municipal Transportation Agency for Cesar Chavez Street were going to be striped this Thursday. Instead, they’re going back to the drawing board, and may not happen at all. Beaupre was addressing a group of about 40 residents who had assembled for a workshop to discuss planned renovations to the section of Cesar Chavez between Illinois and Hampshire (also known as Cesar Chavez East). The meeting wasn’t about bike lanes, per se, but bike lanes were what the group wanted to talk about. Removing one eastbound lane on Cesar Chavez and replacing it with a bike lane on each side of the street has been a part of SFMTA plans for Cesar Chavez since at least 2009. The plans themselves were the result of two years of collaboration between the San Francisco Planning Department, SFMTA, the Department of Public Works, the Public Utilities Commission and multiple community groups. But, said Beaupre, when SFMTA was planning the Cesar Chavez redesign, the Planning Department’s visions for Cesar Chavez were not taken into account. Although the two agencies have been in talks for many months now, it was only recently that SFMTA abandoned the bike lane plan as it stands now. The Planning Department’s intentions for the Cesar Chavez/101 interchange are ambitious, and backed by a grant from CalTrans. They include completely rebuilding the on-ramps to make them more logical and less confusing, while also allowing for bike and pedestrian traffic and providing safe, well-lit social spaces where people can congregate and hang out. Parks, trails and art under the overpasses are all components of the plan. In the meantime, though, Beaupre said that Cesar Chavez is a vital conduit for industrial traffic. The road is estimated to carry 30,000 vehicles daily, moving goods in and out of the Port of San Francisco as well as through the few remaining industrial areas of the city, which are all east of Highway 101. Turning an eastbound lane of an already narrow and busy street into a bike lane could lead to 1,200- to 1,500-foot-long columns of idling trucks, said James Shahamiri, an assistant engineer for SFMTA. A number of businesses in the area had expressed concern about the lane’s impacts on the flow of goods, he added. Belatedly, SFMTA realized that its project was not consistent with the Planning Department’s goals. But a total of three transportation plans are in progress for that area of the city, Beaupre clarified at the meeting — a fact the public was slightly confused about. When the Cesar Chavez redesign was being planned, information about another plan, Bayview Transportation Improvements — intended to develop a more direct auto and truck route between 101, the redeveloped Hunters Point Shipyard and the South Basin industrial area, while reducing truck traffic on Third Street — was not taken into account. That plan depends on Cesar Chavez remaining a place to go through. A number of meetings are planned for this summer to discuss short-term fixes for the Highway 101 interchange and the SFMTA bike lane plan, and on the Planning Department’s Cesar Chavez East redesign. Interested community members can email the Planning Department for updates about the process. 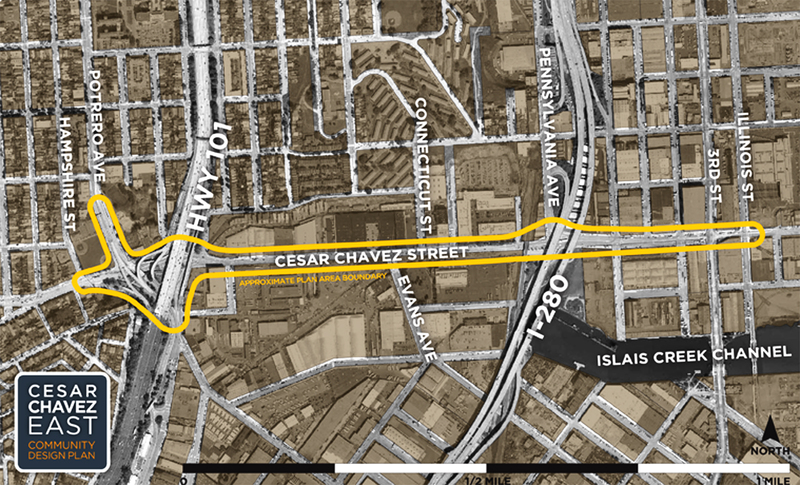 Meanwhile, the city began planned street renovations for Cesar Chavez between Guerrero and Hampshire this past Monday. NextLabor Unions to Set Their Own Paychecks? Do we really need tractor-trailers belching diesel smoke in our neighborhoods? Surely the era of heavy industrial production in SF is over. We need bike lanes and traffic calming, not a truck freeway. People live on Chavez. It shouldn’t be I-710. It seemed like a strange idea in the first place — why take the LEAST bike-friendly street and make it into one of the most? There’s plenty of other routes they could have gone with instead. I have to say, if you got to the 22nd street caltrain, there’s really no other way. You could bike up to 17th, but that’s an extra 10 blocks or more, depending on where you are coming from. It doesn’t need to be the most bike friendly, but as a designated bike route, it needs to have some room for bikes. Right now, a car door could propel you into 40mph traffic. It stinks right now. This is terrible news! A bike lane on ceasar chavez east is a critical connection for many neighborhoods to efficiently get to the caltrain stop at 22nd street. While some of us tough it out and dance with the semi’s, many more folks would ride to the train station and the waterfront if they felt safe doing so. Can you please tell me another route to get from Bayshore to Illinois street. Do you actually ride a bike in SF? This is a huge disappointment. I have to ride on this section of Ceaser Chavez every day to work and back and I can honestly say it is the scariest section of road I have found in the city. Even though it is designated as a bike route and there are signs up and down the road denoting this, drivers on this route are surprisingly unfriendly to cyclists. I am constantly being honked at or worse a car likes to make its presence known by getting dangerously close to me while speeding by at 40-50 miles an hour. Traffic moves quickly and the lanes are already tight, removing a lane and making more space for everyone makes perfect sense. I certainly hope that this is reconsidered. I had been anxiously awaiting this change for a while, but I guess it will be longer before i can safely commute to work. I am sick with disappointment. It is interesting that some people felt that a “plan had all been agreed upon”. But there had only been one public meeting on the project and no plans had ever been showed to the public; So how could everything had already been agreed upon? It seems that this just reflect poorly on the Planning Department. They just talked to a narrow group of people rather than getting everyone who would be affected involved in the process. Unfortunately, that is the way the Planning Department operates — they have their agenda and really don’t care what the public thinks. On occasion this blows up in their face — like it did here and like it did with the Noe Valley parklet.